I’m not a big superhero fan, truth be told. Since reviewing comics for BCP I’ve tended to stay away from the output of the Big Two, both because it’s not really my bag and because I honestly wasn’t sure if I could do the comics justice like so many of my compadres can. I mean, after growing up on DC and Marvel I’ll always have a fondness for the characters and stories of my childhood but as my tastes changed I steadily moved away, as the constant rebooting/rebranding from both companies left me feeling rather cold. But sometimes you have to move beyond your comfort zone so I found myself sticking my hand up when this was announced, as the latest debut issue in DC’s Rebirth reboot is a biggie, pulling together the three most recognisable heroes in its stable; Superman, Batman and Wonder Woman. After the turgid, convoluted mess that Zack Snyder gave us with this Summer’s ‘Dawn Of Justice’, my hopes for its comic counterpart weren’t particularly high. My biggest problem with the genre boil down roughly to the same obvious criticisms others have, namely that it doesn’t seem interested in much else besides setting the players in motion for the obligatory fight scenes. 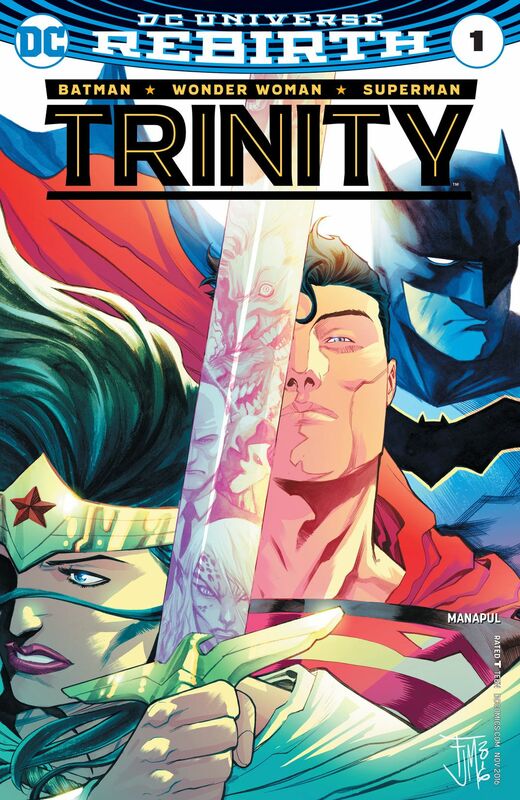 But I’m happy to report that writer/artist Francis Manapul delivers a pretty low-key – in a good way – first issue, as our trinity of heroes meet for dinner at the Kent farm and reconnect in an issue that’s high on characterisation and drama and low on brainless fisticuffs. The reasons these three make for such an interesting dynamic are all present, from Bruce’s pragmatic view of the demi-God in their midst to Clark’s wrestling with his purpose and whether he can live up to the ideals so many hold him to, both as a father and symbol. Bruce and Clark’s mutual distrust of each other is counterbalanced by Diana’s wiser, more thoughtful approach, and the scene later in the issue as her and Lois connect under the porch and discuss the awkward undercurrent of both loving the same man is great, full of pathos and touching warmth. Manapul also pulls out all the stops on the art too, as he employs some scorching panel compositions and double-page spreads that sit well with the rich, expressive human dimension of the issues quieter moments, all of which are enriched by his colours which range from muted watercolours to bright primary hues. Of the Rebirth issues I’ve read so far this is by far the most promising and, between us, I think it just might have brought me back into the fold.